Today our 7th graders picked up on our theme of needs in a modern world. We spent our morning at Knox County Engineering and Public Works. We learned about transportation and the importance of communication through traffic signals and road signs. Our campers also saw the impact storm water has on our rivers. We finished our day by talking to an architect and touring a 4000 square feet home that is currently being built. This activity allowed our campers to see how architects and engineers work together to produce homes and buildings. Today we were able to learn about our needs of transportation, water, and shelter. Another busy day is done, but our campers have so much more to explore! Today we began week two of Royal Explorers! 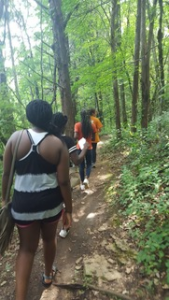 Our eighth graders headed to Anderson School Trails to check out the Urban Wilderness of Knoxville! We talked about the importance of nature, even in the midst of the city. Students solved riddles to find specific herbs and plants along the trail. We also found out that we have some amazing photographers among our students! After lunch and some relay games, the students continued working on their websites. Students thought about how we remember history and how that affects our lives today. They wrote about their experience at Fort Loudon and used the pictures they had taken to build their website. We are excited for them to continue learning this week and be able to show off their websites on Friday!